East Bengal capitalized on Chennai's slip-up at Churchill by beating Minerva 1-0 to move within a point of the league leaders. The result set up a mouthwatering final day in the I-League, where the title will be decided. Chennai need just a win in their final game as they have a superior head-to-head to East Bengal, having won by identical 2-1 margins both home and away. Monday Osagie celebrates Churchill's opening goal vs Shillong Lajong. Churchill Brothers defender Monday Osagie scored the 100th goal of the 2017-18 I-League on Friday against Shillong Lajong. 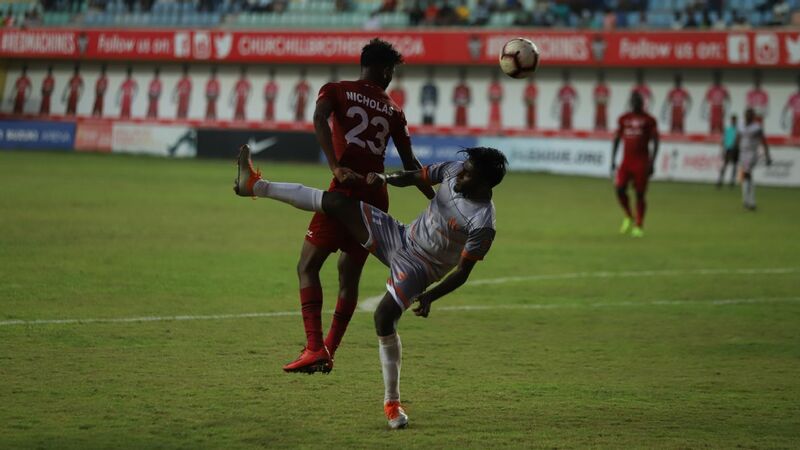 Osagie's hopeful lob caught the keeper off his line, and Lachenpa could only get his fingertips to the ball as it rolled into the net to give Churchill the lead at the Tilak Maidan in Vasco. Britto PM's second-half strike actually took that tally to 101 for the season as Churchill secured a 2-0 win. Nongdamba Naorem (left) after scoring against Shillong Lajong at the Ambedkar Stadium in New Delhi. It was the kind of goal dreams are made of. The striker picked up the ball on the left flank and, cutting inside, wrong-footed two defenders before coming up another block of two, one a burly South Korean and the other a Nigerian. He dodged both men and glided past another centre-back from Africa -- Lawrence Doe had his hands up, probably making sure he didn't trip his man up -- before releasing a cheeky shot past an onrushing goalkeeper. About a month into the new season, Minerva Punjab and Shillong Lajong are the surprise leaders in the I-League, closely followed by Kolkata clubs Mohun Bagan and East Bengal. While champions Aizawl FC are sixth, debutants NEROCA have also impressed, especially with their away form. Here are five standout players from the first month of the league.